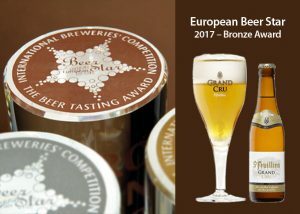 Munich, Germany (September 27, 2017) – Beers from La Trappe, St- Feuillien and Aldersbacher combined for a total of five medals at the 14th annual European Beer Star Awards. The internationally renowned competition took place August 10-11 in Munich, and featured 2,151 beers from 46 countries – the largest amount ever to compete. 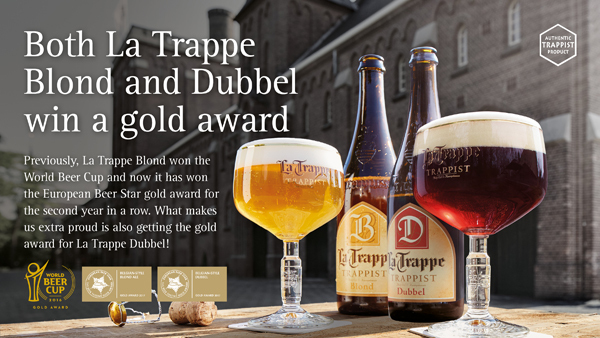 The La Trappe beers brewed by Trappist Brewery Koningshoeven received high honors, taking home two golds for La Trappe Blond and La Trappe Dubbel in the Belgian Blonde and Belgian Dubbel categories. The world-renowned St- Feuillien Grand Cru added to its decorated legacy with a bronze medal in the Belgian Strong Category. 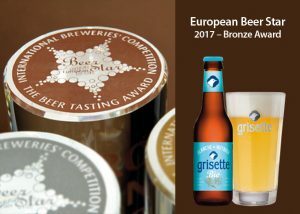 Brasserie St-Feuillien enjoyed two medals with bronzes for its Grand Cru in the Belgian Strong Category, and Grisette Blanche in the Belgian Wit category. The world-famous Grand Cru boasts a delicate nose of subtle hops and fruit over a backdrop of honey-like malt with a dry, distinguished mouthfeel and wonderful fruity and toasty character. The relative newcomer Grisette Blanche is a 5.5% ABV ale with a thirst quenching body, piquant coriander and orange aromas underneath a thick goldenrod head of foam. It finishes smooth with minimal bitterness. St- Feuillien’s Grisette Blanche took home a bronze medal in the Belgian Wit category, cementing its status in the pantheon of great witbiers. Pierre Hensenne, Export Manager, St-Feuillien adds: “We’re very proud to strengthen our leadership in these two beer styles, considering both were also recently awarded gold medals at the World Beer Award competition (Grand Cru in 2017 and Grisette Blanche in 2016). 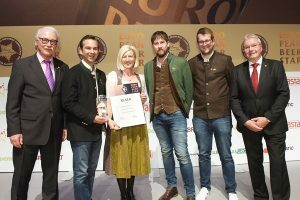 Representatives from Braurerei Aldersbacher celebrate their silver medal win in the Kellerbier category for their Zwickelbier, a 5.5% ABV unfiltered offering distinguished by its mild, pleasant flavor and particularly full body. Bavarian brewer Brauerei Aldersbacher received a silver medal in the Kellerbier category for its Zwickelbier, a 5.5% ABV unfiltered offering distinguished by its mild, pleasant flavor and particularly full body. Beers from these award-winning breweries and many more are available in the U.S. nationwide by way of Artisanal Imports. Ultimately, brewers from only 21 of the 46 competing countries won medals, a testament to the extraordinary level of competition present and the level of perfection required to reach the podium. Interested in selling these award-winning beers at your restaurant, bar or retail store? Interested in becoming a distribution partner for La Trappe, St-Feuillien or Aldersbacher? Please contact Lanny Hoff for details. For interview opportunities with the winning breweries, or for more information, please contact Lanny Hoff at +1 (612) 245-5433 or by email at lanny.hoff@artisanalimports.com. About Braurerei Aldersbacher: Aldersbacher’s history begins in 1268 as a monastic brewery, building a reputation over the centuries as one of Bavaria’s finest breweries. In 1803, the monastery was closed and in 1811 both it and the brewery were sold to the Baron von Aretin. Over the intervening centuries, the brewery has been improved and modernized and now produces 13 different beers. It is still in the family today, owned and operated by Ferdinand Freiherr von Aretin. Though still a local brewery, its beers are enjoyed by an international audience. Learn more at www.aldersbacher.de. About Trappist Brewery Koningshoeven: Founded by Trappist monks in 1884, the Dutch Trappist Brewery Koningshoeven has been crafting the finest Trappist ales for over two centuries. Its many world-class style beers and rare limited releases are bottle-conditioned and brewed with water from within the Abbey’s walls, while spent grain from the wort is used to feed the Abbey’s herd of cows. Learn more about the brewery at www.latrappetrappist.com.